Sometimes it takes a village to develop a new recipe. To start, an email in my inbox loudly proclaimed “Free Brie cheese”. I was sold right there. I didn’t know what was required to get the free cheese. Base-jump from the Sears Tower? Crawl across a bridge writhing with snakes? Sit through 8 hours of George W. Bush bloopers? It didn’t matter. I was up to the task. 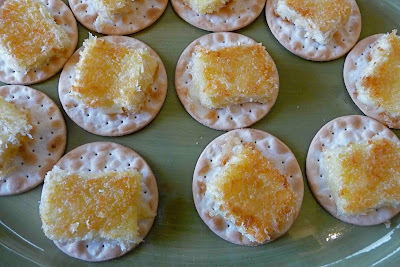 As it turns out, all I had to do was develop a holiday hors d’oeuvres recipe, using a wheel of Ile de France Brie cheese. Full disclosure here: I did in face receive a free wheel of their cheese (which I happen to adore) to make this recipe. All of the recipes will be posted on their blog and you can vote for your favorite. Just click on the star rating that you want to assign to any or all of the recipes. You can only vote one time. My recipe is first on the list. I was racking my brain to figure out a novel way to incorporate Brie cheese into an hors d’oeuvres recipe when Kalyn of Kalyn’s Kitchen emailed to say that Andrea of Rookie Cookery had kindly sent her a large box of Fuyu persimmons. Although Kalyn had made a Whole Wheat Couscous recipe with Persimmon, Grapes, Green Onion, Mint, and Pine Nuts, plus several other recipes, she had many persimmons left over and would I like to try some? Would I?! 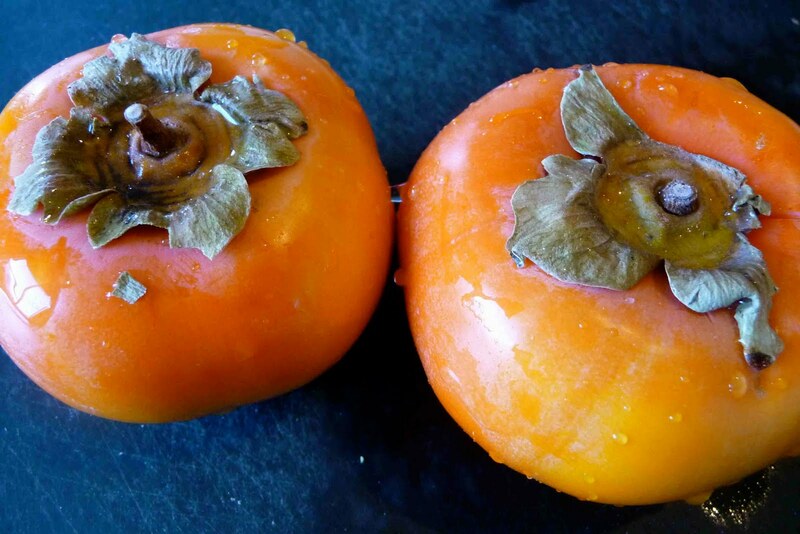 Fuyu persimmons are crisp like an apple with a subtle and unusual sweetness that hooked my whole family. The pieces for my Brie recipe quickly fell into place. Using the persimmons, a little fresh lime juice, and fresh basil, I made a salsa to top the Brie cheese, which I coated in panko breadcrumbs and pan-fried. The result was an hors d’oeuvres of melted cheese (need I say more? ), complimented with the sweet and savory flavors of the salsa. Peel and dice two Fuyu persimmons into 1/4-inch pieces and place in a medium-sized bowl. Add 2 teaspoons fresh lime juice and 4 large fresh basil leaves, chiffonaded (rolled and thinly sliced). Stir well Season with salt and pepper to taste. Set the salsa aside for up to 2 hours. Cut one (7 oz) wheel of Brie cheese into 1/2-inch slices and then cut each slice into 2-3 squares (depending on the length of the slice). You should have about 32 squares of Brie. In a small bowl, beat 1 egg and, in a separate bowl, place 1 cup of panko breadcrumbs. 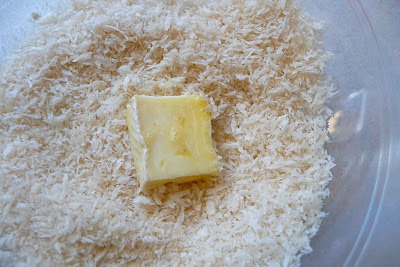 Dip each piece of Brie cheese into the egg, letting the excess drip off and then press into the breadcrumbs, ensuring that both sides of cheese is covered by breadcrumbs. Place on a plate and repeat the process with the remaining pieces of cheese. Cover and chill until ready to cook the cheese. This can be done up to 1 hour in advance. Just before cooking the Brie, place approximately 32 table water (or other neutral-tasting hors d’oeuvres cracker) on a serving platter. Heat 1 teaspoon olive oil in a medium nonstick skillet over medium-high heat. Add about 1/3 of the breaded Brie pieces to the pan. Cook for about 30 seconds to 1 minute, or until the bottoms of the cheese pieces are light golden brown. Using two forks, flip the pieces over and let the other side brown slightly, an additional 30 seconds to 1 minute. Immediately remove from the pan and place the Brie pieces on the crackers. Repeat with the remaining olive oil and breaded Brie pieces. Top each piece of Brie with 2 to 3 teaspoons of the persimmon salsa. Serve. Place the diced persimmon in a medium-sized bowl. Add lime juice and basil. Stir well. Season with salt and pepper to taste. Set the salsa aside for up to 2 hours. Cut the Brie cheese into 1/2-inch slices and then cut each slice into 2-3 squares (depending on the length of the slice). You should have about 32 squares of Brie. In a small bowl, beat the egg and, in a separate bowl, place the panko breadcrumbs. Dip each piece of Brie cheese into the egg, letting the excess drip off and then press into the breadcrumbs, ensuring that both sides of cheese is covered by breadcrumbs. Place on a plate and repeat the process with the remaining pieces of cheese. Cover and chill until ready to cook the cheese. This can be done up to 1 hour in advance. Just before cooking the Brie, place the crackers on a serving platter. Heat 1 teaspoon olive oil in a medium nonstick skillet over medium-high heat. Add about 1/3 of the breaded Brie pieces to the pan. Cook for about 30 seconds to 1 minute, or until the bottoms of the cheese pieces are light golden brown. Using two forks, flip the pieces over and let the other side brown slightly, an additional 30 seconds to 1 minute. Immediately remove from the pan and place the Brie pieces on the crackers. Repeat with the remaining olive oil and breaded Brie pieces. Makes approximately 32 hors d’oeuvres. Oh yes, I'm definitely sold on this! I love brie and I'm imagining how wonderful it must go with the flavor of persimmons. Absolutely gorgeous with all the flavors and textures in there. Fried cheese—it just doesn't get much better. This makes a very attractive appetizer. Chow & Chatter – Thank you. I had fun coming up with this recipe. 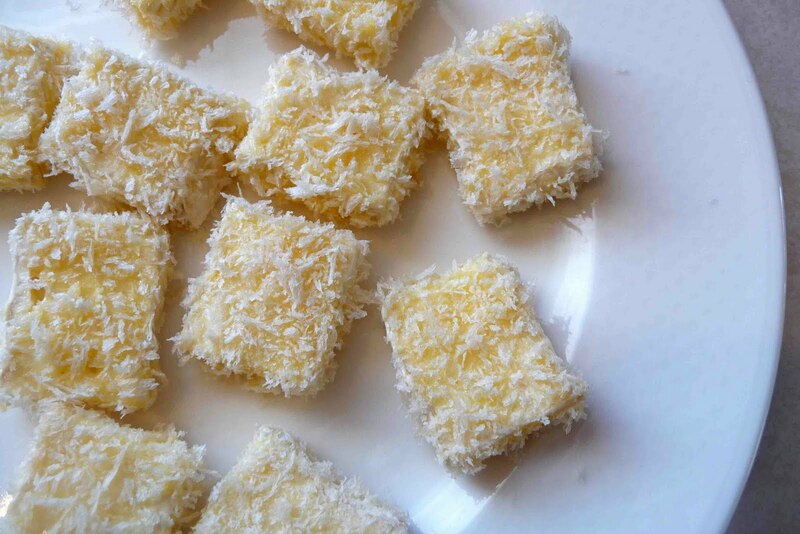 Mel – I'm planning on serving these at a few dinner parties this holiday season. Kalyn – This recipe came together, thanks to you! 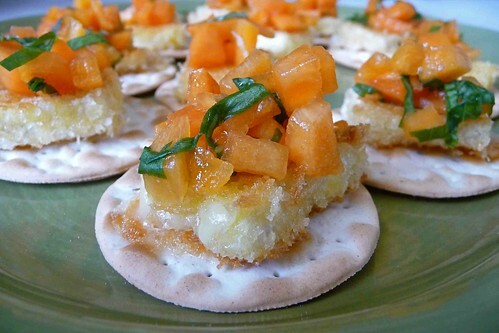 Divina Pe – The sweet & savory of the persimmon salsa was perfect with the creamy Brie. 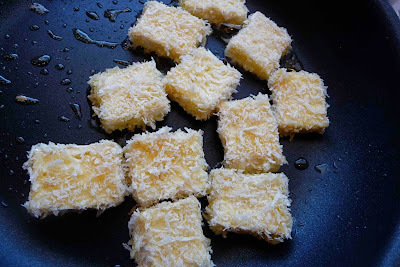 Cathy – I agree on the fried cheese! I'm not really a fan of Brie cheese but those certainly look good. I would at least be willing to try it. 🙂 I might even like it. 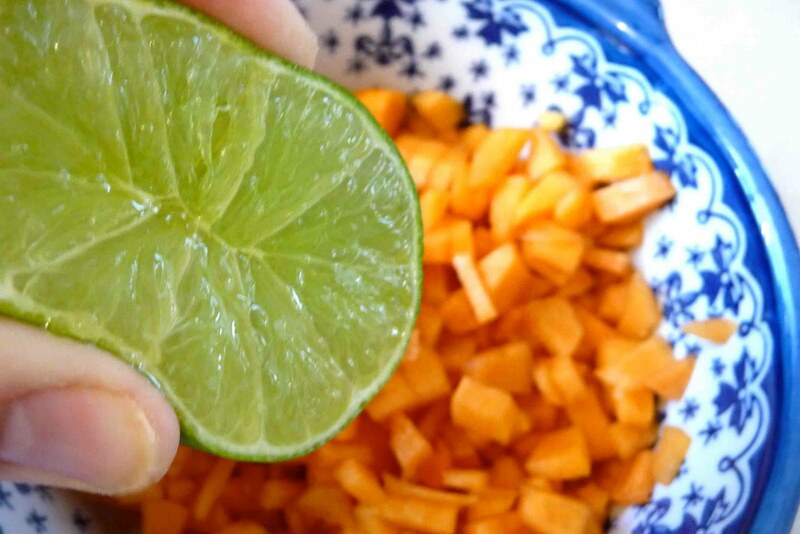 ive never tasted persimmon until a couple of months ago…sounds good with the brie cheese! Found out your blog through food buzz..you have a wonderful blog!…glad to follow you!..yummy and delicious recipes! Oh, Your food is always so delicious looking! Our family has just discovered persimmons this year, and we love them…My kids fight over who can have the last piece when I cut them up! I have no idea what took so long to try them. 1. Indeed you CANNOT go wrong with melted cheese! 2. This looks SO delicious. 3. What does a girl have to do to get some free cheese??? When I read this recipe I was really knocked out by the flavor combination here. Great recipe! Terecita – I think pan-fried Brie might make you a fan! Andrea – Thank you so much for the beautiful persimmons! I can't tell you how much my family has enjoyed them. MrsLavendula – The Brie and persimmons really do compliment each other well. Chelsey – I'm also wondering what took me so long to try them! I wish I could grow a persimmon tree here. Tasty Trix – Thank you! Ile de France approached me about the Brie cheese. You might want to sign up for their giveaways and newsletters. Danielle – Thanks so much! I love persimmons, what a great combination you put together! It looks beautiful. Fantastic! I've never pan fried brie, but glad to know it's doable, as WOW, what a treat that would be. I love the idea of incorporating persimmons. They are just beautiful little gems, no? I am going to become mega rich so I can hire you for your fabulous food. My God woman! I can taste this itty bitty delights as I type. Totally off the charts good! I never know what to do with persimmons. They are so pretty, but not a fruit I'm used to eating. Now brie I'm more than used to since I am an admitted cheese-a-holic. Your recipe may get me to use persimmons after all. We're both not huge fans of raw persimmons unless they are paired with foods of different textures. This salsa is probably a better way to eat them. Very creative. From start to finish this is a no-holds-barred perfect appetizer. Who doesn't love brie? Who doesn't love melted cheese? And the salsa is perfect. great appetizers, I'm very intrigued by the pan fried brie cheese, i am so tempted to try that! looks very pretty and delicious. Great for party. OH man oh man! You had me at fried brie…but this looks amazing. You had me at persimmons! I love how you've made them into a salsa, perfect! This looks great! I've got some leftover brie loitering in my fridge that could find it's use here. Very nice creation! Looks delicious! 5 Stars! I love this, what a genius combination with fried brie and persimmon salsa! Picking up persimmons in the store tomorrow to make these! Brie and a fruit salsa have to be a combination worth waiting for. What a great way to use Persimmons, this looks delicious! I've never tried a persimmon, but this looks amazing! What a great combination and so pretty. Can't wait to try this one. Different and lovely, thank you! Holy Smokes! I love brie and I can't get enough of persimmons! I generally eat persimmons straight up, but this is a wonderful spin on persimmons AND salsa! Thanks so much for sharing! Super App! I love brie but unfort. I'm the only one in this twosome who does. This looks like a great way I can get my brie fix by serving it to friends and family. This is a great recipe for the upcoming holiday functions…Thank you. Wow…CC this is so good and I want to grab it from your post here. So delicious looking. As usual this is another winner for sure. Thanks CC for sharing the recipe. Great combo!